"After the idea of this book took hold of me in 1984, and the two of us had discussed it at length, Joe [Joseph Campbell] felt so strongly about the 'Goddess project,' as we called it, that he interrupted work on his great Atlas of World Mythology to edit this book with me and compose his own substantial contribution (Chapter 3) — actually the last whole creative work he was to have time to complete before his passing at the end of October 1987. This is vintage Campbell and he felt that it was, in his own words to me, his letter to the world'." 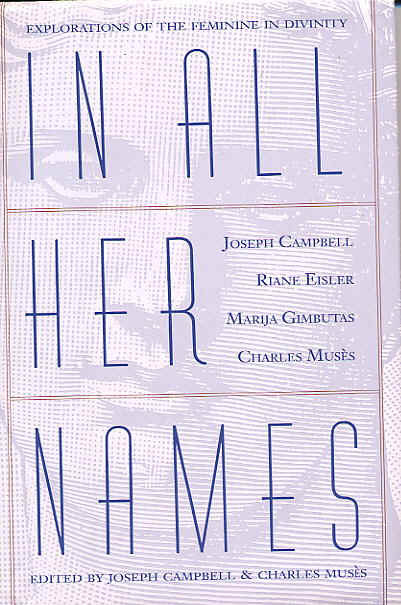 A celebration of the feminine divinity edited by Joseph Campbell and Charles Muses, with contributions by Marija Gimbutas, Riane Eisler, and the editors. "We shall seek to unravel ancient skeins and explore deep roots and powerful impulses and inspirations of humanity, and in particular that tap root and blossom affirming Goethe's ultimate vision. . . 'the Eternal Feminine draws us on'." In All Her Names a work of scholarly delight and mystery. Illuminating the historical, spiritual, and cultural aspects of the Goddess as the natural adjunct to God, this unique collection of essays weaves together the expertise of four eminent voices in recognition of the Goddess. The increasing importance of the Eternal Feminine as a way to a positive non-exploitive worldview is brilliantly mirrored in these four profound explorations. Each essay reveals a different aspect of the Goddess. In "The Mystery Number of the Goddess," this final completed work of his illustrious career, Joseph Campbell makes clear his longtime belief in the Great Goddess. This idea, implicit in his earlier writing, is here viewed by Campbell as the statement of the unequivocal importance of Goddess, not simply God, in his entire approach to mythology and religion. In "The 'Monstrous Venus' of Prehistory: Divine Creatrix," Marija Gimbutas presents a new interpretation of archeological evidence: Goddess figurines are mythic-symbolic, rather than literal, in their portrayals. Riane Eisler discusses recovering the partnership model of ancient societies in "The Goddess of Nature and Spirituality." The exciting researches of Charles Muses in "The Ageless Way of the Goddess" uncover the deep relevance of Ancient Egyptian and Chinese traditions. A chapter of unusual and sustained poetic celebration closes the volume. Unified in their recognition of the vitality and significance of Goddess, past, present, and future, these essays bear impressive witness to a magnificent heritage. Joseph Campbell (1904-1987) is the author of Hero of a Thousand Faces. Riane Eisler is the author of The Chalice and the Blade. Marija Gimbutas is the author of The Language of the Goddess and The Civilization of the Goddess. Charles Muses is the author of Destiny and Control in Human Systems, Illumination on Jacob Boehme, and many scientific papers.